What is it about cardboard and wrapping paper that is so bewitching to a kiddo? I remember forsaking all other toys any time a big ol' cardboard box entered my childhood home. If you had given me the choice of a fort made of cardboard and duct tape versus one of those Fisher Price playhouses, I would have chosen the shoddily assembled cardboard version every time. Recently I've noticed the same tendencies in my own child. I've been saving recycled toy ideas to make for Lucy on my Kiddo Activities and Kiddo Pinterest boards, arming myself with project ideas to encourage this make-do mentality in her play some day soon. I can't wait until she's ready for scissors and glue, but in the meantime, I thought she'd really enjoy a Mama-made playhouse—and boy, did she ever! We don't have lots of space in our home, so I knew I wanted the playhouse to be easily disassembled and stored behind our big dining room cabinet when not in use. Originally I was thinking I'd use tempered masonite because it's inexpensive, thin, and lightweight. But in the end, I decided foam board would be the quickest/easiest material to work with since all I needed to cut it was my trusty X-Acto blade. A foam board playhouse certainly won't last forever, but if Lucy plays with it often enough, I'll definitely consider using these pieces as a template for a masonite version that she can use outside too. Is this playhouse recycled? Well, no, it's not. But it sure was cheap and lots of fun for both Lucy and me, so I'd say it's a big win! 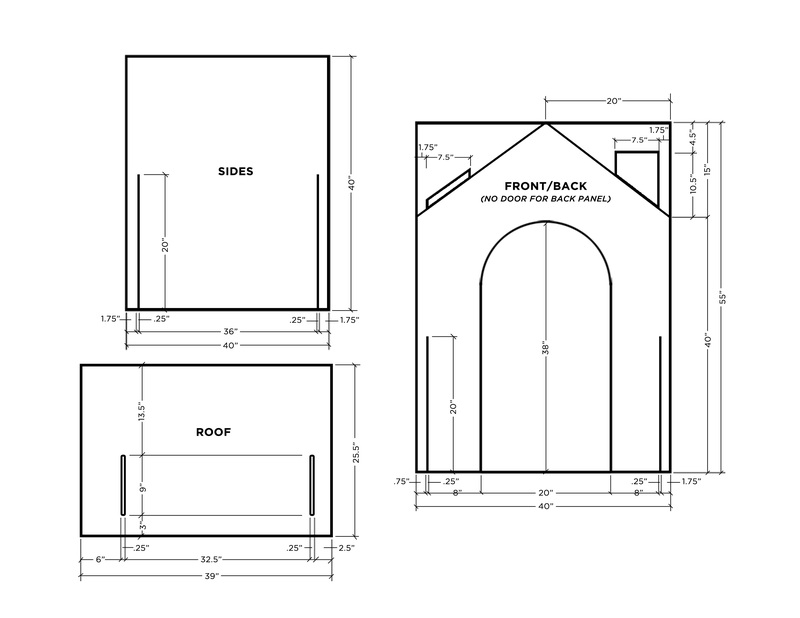 I drew out the measurements I used so you can make your own cardboard playhouse without all the guess work. (Click to print.) But if you are working with smaller pieces of cardboard or an actual box, why not come up with your own design? It's very helpful to have a t-square when marking out the measurements for each panel of the house so you don't have to measure down from each side of the board to get straight lines. I also don't recommend using a marker as I did, but I wanted the photos to show the lines clearly. I'd use a pencil instead so your lines won't be visible if they don't all get cut away. I used household objects as guides for the round shapes in the playhouse like the window, the arched doorway, and the doorknob. After cutting out the door, you'll want to cut away a little extra around it so that it will easily open without getting stuck inside the opening where you cut it from. Once all of your pieces are cut out, you're ready to slide it all together! I was able to assemble the entire house without any assistance, though it would have been nice to have some help standing up the two sides of the house while I slipped on the front or back panel. I used white duct tape as a door hinge, but I recommend using duct tape to wrap where you will be taping first, so if the door pulls in the wrong direction (which it will if kids are using it), the tape of the hinge won't pull the outer layer off the foamboard. I think Lucy's favorite part of the playhouse has been filling it with all of her toys, and then throwing them out the window and into a basket she has placed outside the house. Her poor Teddy sure has been through a lot since I built the house! But at least I can testify to the fact that my toddler is quite the baller. We loved the simple white style of the playhouse, but decided to jazz it up a little bit with the addition of paint, gingerbreading, shingles, and a little more detail drew on with a Sharpie paint pen. There are so many ways you can go with this—it's really a lot of fun! I used this pink floral spray paint for the gingerbreading and door, and used a regular brown spray paint (I believe Rustoleum brand?) for the shingles. I used hot glue to hold the shingles in place and rubber cement for the gingerbreading. Credits // Author and Photography: Mandi Johnson. Photos edited with Stella and Valentine from the Signature Collection and Pearl from the Fresh Collection. This is adorable. I’m totally grown but a little jealous of Lucy. This is the cutest thing ever! I want to make one for Asa, only decorated as a treehouse or something. SO cute. I would love to make this little house one day for my future little kids! How darling. It also looks not too difficult to make. 🙂 Love! Such an amazing idea, Mandi! Well done! I love this design- my son would love one. Do you think the template would work with plywood instead? I try to only use natural eco-friendly materials, so I’d much prefer to use plywood. Do you think it would work? Absolutely amazing, such an inspirational post!! Well done! I absolutely love this! I want to make one for myself, just for myself…! Love! I have a smaaaaaallll home with 4 kids. I like the idea of this disassembling! I would love to make this for my daughter but I’m feeling that she is just way too tall! This such a cute idea and super practical idea, I love that you can get creative and decorate it however you want! This is really cute! It’s taking the refrigerator box playhouse to the next level for sure. Great work, Mandi! That’s so beautiful! I love the idea of an indoor playhouse. So spiders (usually) to clean out of it before they play! I wish wish l had a young girl, even my two grand kids are to big, l just love it and am thinking of doing a smaller one for the house and have flowers growing from the bottom birds on the sides, ideas are all over my head. But its about time l woke up and smelt the air. Where were you able to find foam board in that size? This looks so amazing! I am already getting ideas for my little boy, possibly involving a castle to raid. Thank you so much for posting this! Thanks Mandi- I will have to give it a try! This is a wonderful idea! It makes me want to have kids so I can make one! Love this idea. When i first saw the post I thought there is no way I could make that, but really you guys made it look easy. My kids would really enjoy this house. Here is to hoping mine comes out as cute and not lop sided. This is wonderful! What is the thickness of your foam board, and how did you know how wide to cut the “slide in’s?” My husband and I are going to make this with tempered masonite, so I’m trying to figure out how wide to cut the “slide in’s.” Thanks for sharing!!! I want to make this right now I’m so excited about it. Where can you find foam board so large? I plan on using velcro for the decorations so it can be changed for different seasons and holidays! Amazing idea! I plan on putting the decorations on with velcro so that they can be changed for different seasons and holidays. Thanks for the plans! this is awesome! my parents built me one in the early 90’s. Hi! Im Ross a father to a very cute beautiful daughter and full time graphic designer by profession>. Your doll house project has given me an idea to start a small business since where I live, the supermarkets don’t offer doll houses. I see these playhouses as an escape from the gadgets that our kids use everyday. Thank you for posting this.